Looking to soften the edges of your modern decor? 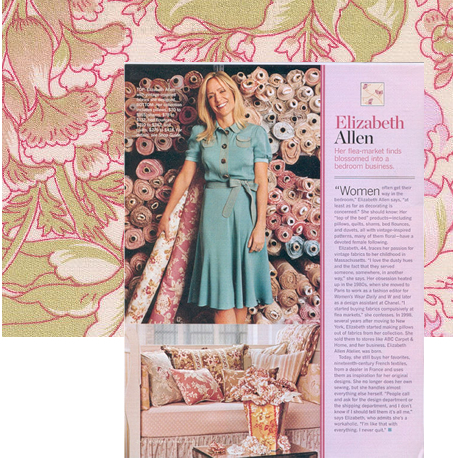 You'll love the cherished patterns inspired by days past from Elizabeth Allen Atelier. Quick bio (and most impressive): her love of fashion launched her straight into WWD and W magazine in Paris as bureau fashion editor, worked alongside fashion icon Karl Lagerfeld at Chanel (drool! ), served as fashion editor at New York Magazine and in '98, she launched her own textile company, Elizabeth Allen Atelier, located in NYC's garment district. Here's a copy of her most recent press in O magazine and be sure to visit her online. Do you see patterns such as these in YOUR home?